Recently we have proposed an alternative accelerator structure driven by a CO2 laser. The Surface Wave Accelerator Based on SiC (SWABSiC) is based on a polar semiconductor, SiC, that supports infrared surface waves at the SiC/vacuum interface because its dielectric permittivity is negative within the tuning range of the CO2 laser. The SWABSiC structure can be employed as (i) an accelerator, in which case an external laser beam is needed to supply energy to the accelerated beam; or (ii) a radiation source that uses a pre-bunched electron beam to generate mid-IR Cherenkov radiation. Application (ii) can be potentially useful as a diagnostic tool for high-energy beams (e.g., at FACET or ATF facilities). So far we have succeeded in fabricating and optically testing the SWABSiC (at low power). 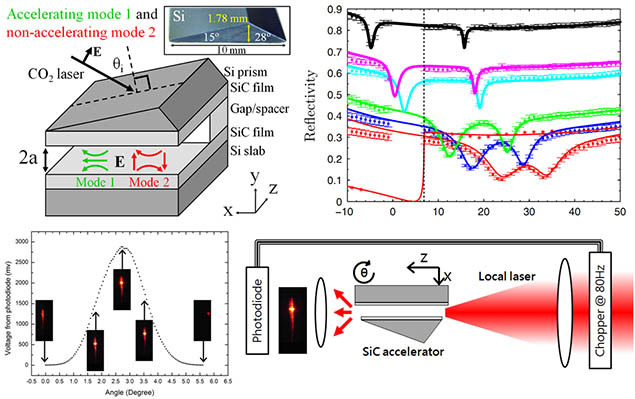 Using a line-tunable CO2 laser, we have succeeded in experimentally measuring phase velocities and quality factors of the accelerating and deflecting modes of the SWABSiC. To our knowledge, this is the first metal-free fabricated and optically characterized macroscopically-sized laser-driven accelerating structure.